One of the biggest investments that you will have to make when building a new factory is in the freezer or cold storage area. Quite often, the reason for this high cost is the fact that major changes to the industrial building have to be made in order to contain the cold. To avoid having to make major changes to the structure of your existing building, a much better options would be to install a modular cold storage building. 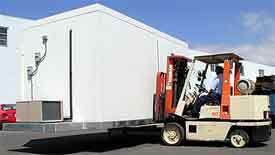 Self contained modular cold storage buildings provide a complete solution for your cold room needs without the need to change the structure of the building. These units can be moved with a fork lift and can be installed either inside your existing facility, or in a suitable outdoor location. There are a number of reasons why your business may need to invest in a cold storage area. Perhaps you work with a lot of volatile chemicals that cannot be stored at high temperatures, or perhaps you simply need an environment where the temperature can be controlled within very specific limits. Whatever reason you have for wanting a walk in freezer or cold storage room, Easy Rack will be able to custom design and install the perfect solution for your needs and supply you with the necessary equipment. We work with the leading manufacturer of modular cold storage buildings to offer a comprehensive range of cold room products to suit your exact needs. Recognizing that every business has its own requirements, we will produce a custom installation plan that will provide you with the exact facility to meet your needs. We work to the highest possible standards, and make use of only top quality materials and components in the construction and installation of modular cold storage buildings, so when you buy from us, you can be sure of getting the best possible cold room for your investment. Our cold storage units are supplied complete with all the systems fully tested and ready for use, or as knocked down self assembly versions for installation within a building where there are access issues with installing a complete unit. The base of the modular cold storage building is made from structural steel, and has integrated fork lift channels that allow it to be picked up and relocated with ease. The floor and walls are fully insulated to improve the efficiency of the cooling systems, and the walls are finished with a powder coating to ensure a long life for the unit once it is in use. Thanks to the integrated cooling systems, once the room has been put in place either inside your facility or in a suitable outdoor location, it simply needs to be hooked up to a suitable power supply, and switched on. The temperature control system allows you to set the optimum working temperature of the modular cold storage building, and then leave it running. Fully insulated walls, floor and ceiling keep the operating costs as low as possible, while producing the best possible environment for storing items at the correct temperature. As you continue to read through our selection of Modular Cold Storage Buildings keep in mind we stand ready to answer any questions you may have about our offerings. Call us at 1-888-776-3720 whenever such questions arise and let us help you make the best investment within your budget. Easy Rack carries a wide variety of commercial shelving, material handling equipment, commercial lighting, used pallet racks, and modular prefab buildings installed nationwide. If you can not find what you are looking for call us toll free at 1-888-776-3720 and we will find it for you. Our home office is located in Houston, Texas, Tennessee, Baltimore, Maryland, Irving, Texas, Amarillo, TX, Brownsville, Texas, Grand Prairie, TX, Pasadena, Texas, Fort Worth, Texas., El Paso, Texas., Charlotte, N.C, Milwaukee, Wisconsin, Seattle, Washington, Boston, Massachusetts, Denver, Colorado, Louisville-Jefferson County, Kentucky. Prefabricated Portable Freezer Storage! Because the needs of each installation of a portable freezer storage room are different, the units can be made to the individual specifications.